The Square Foot Gardening™ method developed by Mel Bartholomew has taken the world by storm. The Square Foot Garden is basically a framed, raised bed vegetable garden, filled with what is known as “Mel’s Mix”, a homemade blend of peat moss, vermiculite and commercially available composts. This mix is an essential part of Mel's method, and the recipe is designed specifically to provide adequate aeration, water retention and plant nutrition. The frame is made of wood, landscape bricks or other materials which are laid out in whatever size desired - though generally no wider than 4 feet so that you can reach the middle from either side without stepping on the soil and compacting it. Vegetables are planted within these boxes on one-square foot grids, which allows for planting different vegetables in different one-square foot sections within the same box. The one-square-foot grids are physically laid out across the top of the raised bed box with wooden lath, strings, bamboo stakes, or anything else that works to visually separate the bed into one-square-foot sections. This is the main thing that makes it different from other framed raised bed systems. Square Foot Gardening beds can be built anywhere, on a section of lawn, in place of a front-sidewalk flowerbed, or even on your deck or driveway (if the box is built deeply enough)! Adaptable to different-sized yards, or even on patios or decks if the bed is built deeper and with a bottom. Easy to learn and a fun way to get started for beginners. Initially expensive and resource intensive. The bed must be built of a rot-resistant wood such as cedar or redwood (pressure-treated lumber or cinder blocks will leach toxins into the bed), and you must use a homemade potting mix which includes peat moss and vermiculite. Not "sustainable" in the big picture by true definitions of sustainable, because of the use of peat moss (which believe it or not, is a non-renewable resource), building materials that will eventually need to be replaced, and soil mix materials. Even though the boxes may last many years, they will need to be replaced at some point as they will eventually rot. All this must be imported from off the land. Once the bed is built, you can’t change where you want the garden without moving a giant box filled with a few hundred pounds of potting mix. Framed edges actually make a great hangout for earwigs, other bugs and weeds. Quackgrass (or crabgrass) will grow roots right under and even through the wooden sides. This is not a big deal, but it’s not quiteas “care-free” as it sounds. All New Square Foot Gardening by Mel Bartholomew is easy to read and full of enthusiasm, great pictures and good solid gardening information. 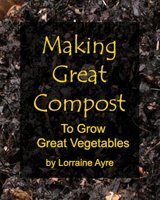 Aspects of the book are simplistic, but overall it is an excellent resource and provides a lot of great general gardening information on a variety of crops, as well as compost, seed starting, and building trellises. If you want to follow this method, buy the book – it’s well worth it and tells you everything you need to know. Mel's website also has some videos and a schedule of classes.